HDMI Output Provides Superb HD Picture Quality. View your inspection on your monitor.Reduce eye strain and neck fatigue. 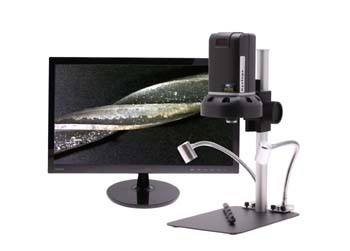 This innovative inspection scope connects directly to a monitor through a convenient 1080p HDMI output allowing operators to see high quality images while looking straight ahead at a large screen, rather than hunching over narrow microscope eyepieces. A large working distance and 30 LEDs that can be adjusted for intensity allow examination of objects of various sizes. Magnification ranges up to 132x on a 21.5" HD monitor.